The Rose Puffball Frock, by Ghee, for the December round of SNEAK PEEK, is a sumptuous design of delight! The delicacy, of this most feminine dress, is made apparent in soft, graceful lines of the silhouette. The full puff sleeves of the garment acts a beacon to draw the eyes upwards to your lovely face, accenting your ethereal beauty. The dress has a deep cut v shaped back, that reveals a lovely expanse of skin. It also has a lovely v décolleté, that is adorned with many small, very finely, detailed Roses. Look closely, and you can see each petal, that make up each Rose, all of which, adds a frailty of gentleness, to the garment and helps to set it apart as something special to behold. The dress fans out, from a fitted waist into a slightly voluminous balloon shape that tapers into a narrow hemline at mid thigh. The exquisite fabric has been silk screened with many many Roses that subtly run, in the ombre style, from the Pastel Lilac, of the bodice and sleeves, into the Aqua Blue of the skirt. Fashion insider tip: The phenomenal designer, Beatrice Serendipity, is an great admirer of the beauty of the Rose and from that love, she was inspired to create the Rose Puffball Frock. The veiled fascinator is very becoming, as who can resist a woman in a veil! It is comprised of one giant Rose, attached to a headband of smaller Roses on each side of the head. It has a fine netted Lilac colored veil with bead accents. It is so very pretty! In this ensemble, you will be the very picture of womanly virtue, that is to be cherished and protected, as it exudes a gracefulness of exquisite elegance. Be fashion forward and head over to SNEAK PEEK, before January 5th, when this round ends, and pick up the charming Ghee Rose Puffball Frock. Your winter wonderland sleigh awaits! This stunning fascinator, is a sail boat upon turbulent waves of Blues, Purples, and Red, with it’s gem encrusted sail of Kalahari Diamonds and Aquamarines, facing forward from the jeweled blaze of the sun, richly decorated in Garnets, Padparadscha Sapphires, Kalahari Diamonds, and inspirational words. 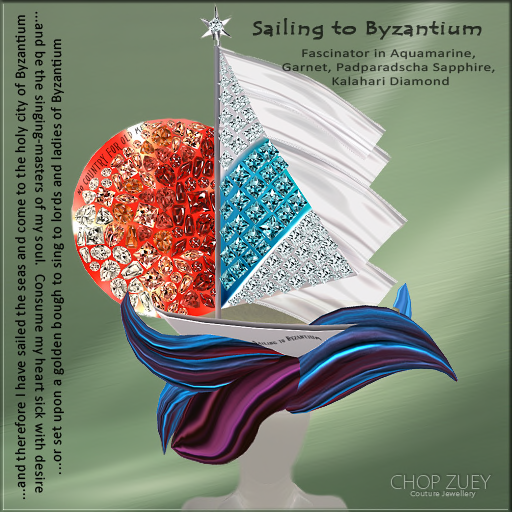 It’s side emblazoned with “Sailing to Byzantium” and the mast topped off, with a star formed, from the Kalahari Diamond.What I get from Belle’s breathe taking work, is to celebrate life through art. Art bears witness to the past, the present, and our future! Thank you Belle, for this awe inspiring creation, which you can purchase at the awesome Art In Hats 2014 Event, which runs until July 31st! As you can see, this beauteous sailor celebrates life by taking her plane…smiling, it’s much faster! 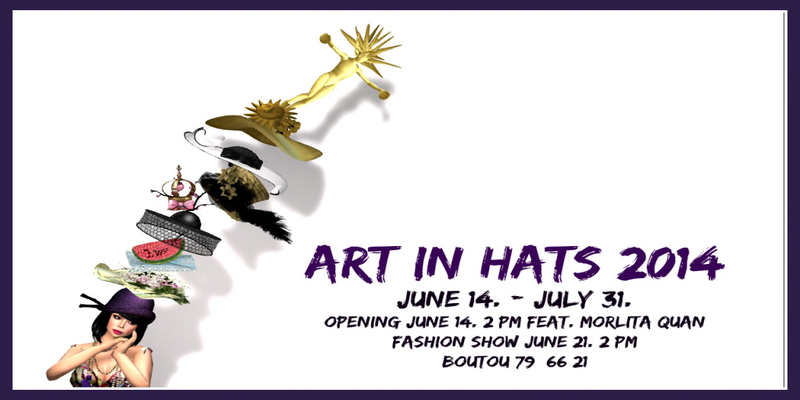 Information on the Art in Hats Event can be found here…. 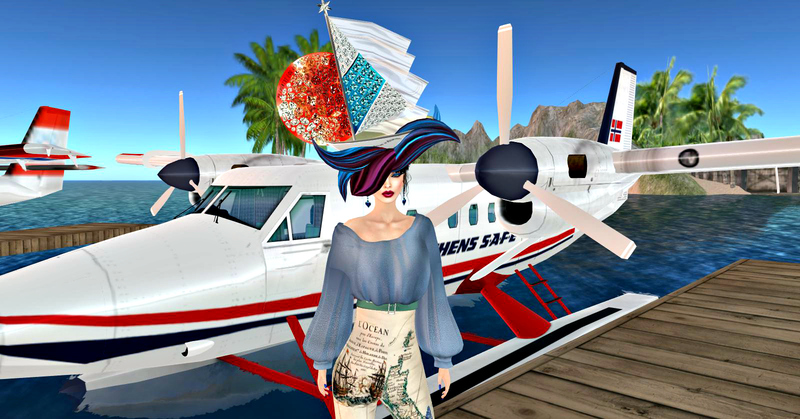 Your sail boat to the Art in Hats 2014 Event is launched here….